Six of Gary Holland’s first 10 financial advisory clients still work with him, a testament to the long-term approach he takes to his work. Only for Gary, it’s not work. He truly enjoys what he does, especially the time he spends with his clients. 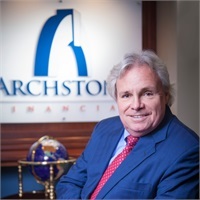 He’s been a financial planner and wealth manager for more than 30 years, co-founded Archstone Financial in 2015, and maintains offices in Worcester and Leominster. Andrea (Andi) Duplessie, Gary’s office manager/assistant, has been working with him for more than 25 years. By his own admission, without her, Gary would not have been able to accomplish what he has over the years. She has a wonderful relationship with their clients and keeps the practice running smoothly and moving forward. New clients come by referral, and Gary meets with his clients two to three times a year to review their portfolios and hear about their lives. He holds the CIMA designation, Certified Investment Management Analyst, and is one of just a handful of financial advisors with this certification, as fewer than 3 percent of financial advisors in the United States have this designation. Married with two grown daughters, Gary and his wife like to spend as many weekends as they can in Boston. They enjoy the active lifestyle the city provides, especially the many great restaurants and sports teams the city has to offer.